Editor’s Note: Jeffrey Kargel is a hydrologist at the University of Arizona and for the Global Land Ice Measurements from Space project. 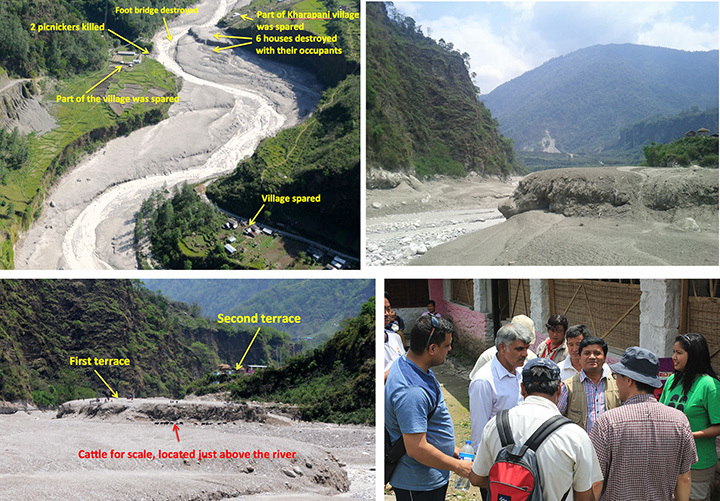 This is his account of the research he did during the aftermath of a deadly flash flood in Nepal’s Seti River Valley to determine its cause. You can read more about the event here. On May 5, 2012, I was attending a conference at ICIMOD (the Kathmandu-based International Centre for Integrated Mountain Development). I heard about the terrifying disaster that day. A flash flood—what geologists call a hyperconcentrated slurry because it was thick with suspended silt—had torn through some villages along the Seti River, in north-central Nepal, just north of the country’s second largest city, Pokhara. It was immediately recognized as a very deadly event, but the death toll—and a tally of those who remain missing but were clearly also killed—was not known exactly for several months. Seventy-two souls lost. Though not large on the scale of global disasters, this event was terrifying for the fact that it seemed to come from nowhere—literally from beneath a blue sky. Furthermore, there was no immediately evident cause. Nobody and no camera captured the whole event, but there were bits and pieces that had to be spliced together, and missing parts of the story had to be built from the ground up—literally from the rocks and sediment involved in the disaster. 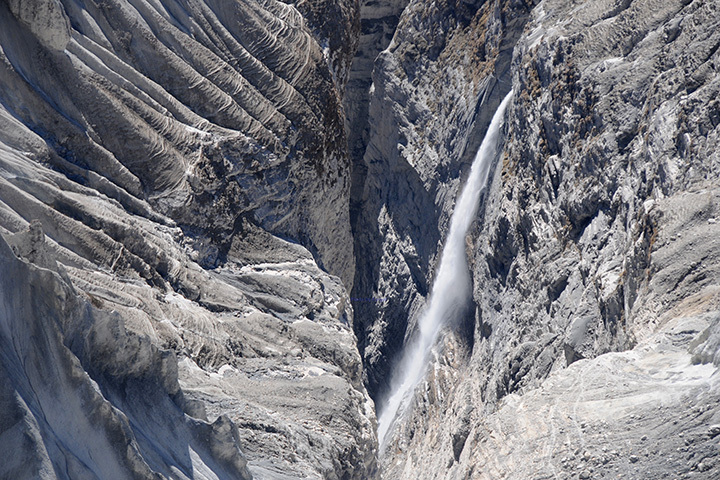 Seeing that the disaster occurred at the foot of the Annapurna Range, within the Greater Himalaya, probably every expert’s first thought was “glacial lake outburst flood” (GLOF), because these were common in Nepal’s Himalaya, and the news accounts of the disaster event resembled accounts of GLOFs from other parts of the country. It took me 10 minutes to examine recent satellite imagery enough to see that there were no lakes, at least not in the images I examined, that could have burst out like this. So either there was a hidden glacial lake somewhere—maybe under the glacier ice—or a glacial lake developed very rapidly and then drained that tragic day, or—far more probable—this was not a GLOF at all. 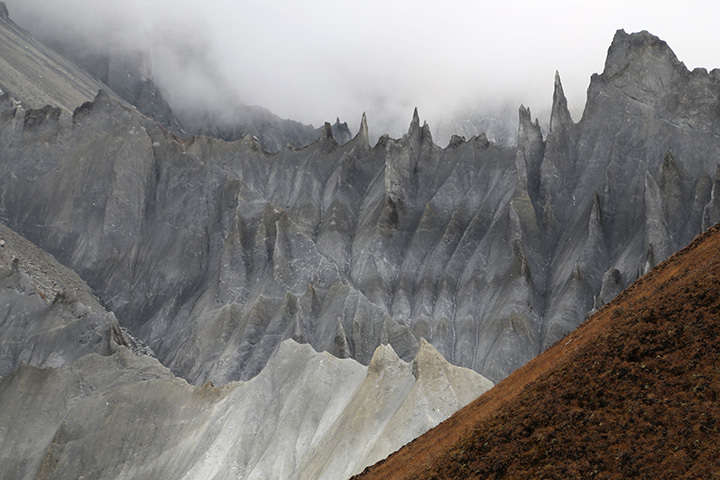 It was, however, clearly a disaster that had its source in a high Himalayan amphitheatre-like bowl, a glacially-carved structure called the Sabche Cirque. This structure was rimmed by some of Nepal’s most famous, picturesque mountain peaks, including the storied, holy Machapuchare (the “fishtail” peak) and Annapurna IV, a 24,688-foot (7525 m) soaring metamorphic buttress of metamorphic rock. One of the most important pieces of information on the cause of the disaster was obtained from wingtip cameras mounted on a tiny 2-seater tourist plane. The pilot, Captain Maximov, had observed what was obviously a giant avalanche—bigger and browner than any snow avalanche he had ever seen before; he then he saw a massive flood wave pouring down the Seti River valley. It was evident immediately that this brown cloud of roiling airborne debris was connected to the trigger for the disastrous flood. This distant view provided in the tourist plane’s video, in addition to later observations I was able to make from the Sabche Cirque itself, led to a confident sourcing of the brown cloud and the disaster’s trigger on a ridgeline near Annapurna IV. Apparently part this ridge—probably initially the glacier ice— collapsed, dropping ice and rock over 3000 m almost vertically (about 10,000 feet) onto unconsolidated rock debris (glacial moraines and ancient glacial lake silts and gravels) resting unstably in the deep bowl of the Sabche Cirque. 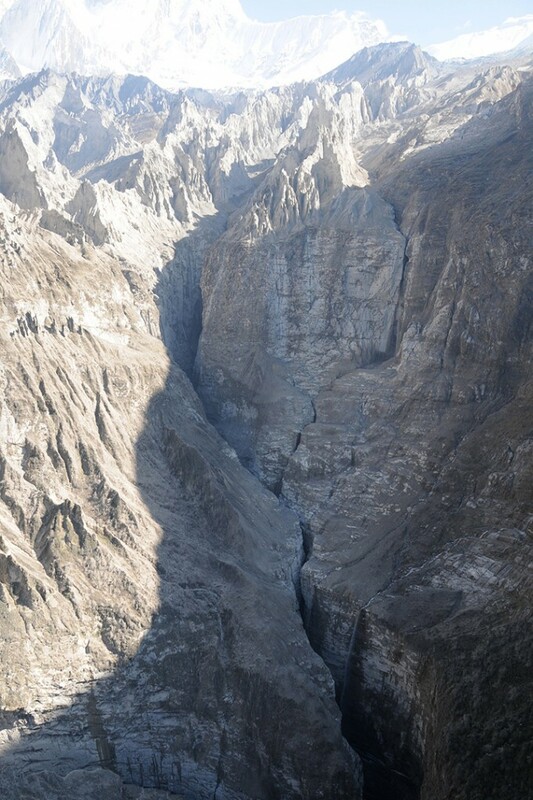 Some of that loose debris was also swept up by the avalanche, and the mass flowed an additional 1,500 meters (about 5,000 feet) into the Seti River gorge. The triggering avalanche—though enormous and bigger than almost any normal avalanche—was the easy part of the explanation of the disaster. The hard part was identifying the source of the water, because there was no glacial lake or no known lake at all in the area. Somewhere a large amount of water had been stored and then suddenly released. Speculation centered on water contained within unseen and unknown caves, or within the deep gorge of the Seti River, and last of all, possible subglacial lakes or lots of little ponds that acted like one big lake. This flood appeared to behave like a glacier lake outburst flood, and the news media can be pardoned for having assumed that it was. From that first day, I and other experts tried to counter the media view that it was a GLOF, but anyway, it was a lot of floodwater. Since I was in Nepal, I immediately contracted for a helicopter to fly me and some colleagues over the Sabche Cirque. 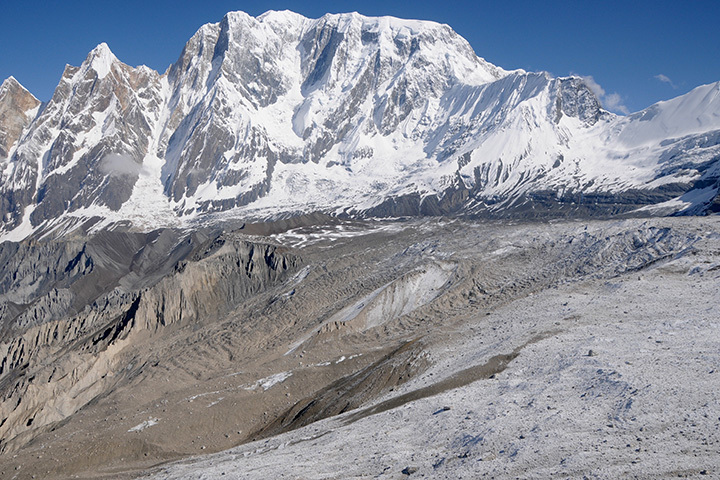 We observed directly evidence of the avalanche—boulders and dust and snow-like pulverized ice in a huge sheet, and streamers of debris emanating from the base of Annapurna IV to the head of the enormous Seti River gorge. We helicoptered over the glaciers and found some small ponds, but nothing that could explain the volume of water; and besides, the ponds were in the wrong place to have been strongly affected by Annapurna IV’s ice/rock avalanche. The pathway of the avalanche became ever clearer after post-disaster Landsat and ASTER images showed clear details of the avalanche deposits. Speculation was now focused toward the gorge. Could something have blocked it? Well corroborated resident eyewitnesses interviewed by our team indicated that one to three weeks prior to the disaster, the Seti River had slowed to a mere trickle of clean water, unlike the usual turbid, sediment-laden “glacial milk.” (Seti means white, so it is the White River.) These various observations and ideas had already started to coalesce when my assistant, Greg Leonard, observed a speck of change that had occurred in “before” and “after” ASTER satellite images. We had a specific spot to look for a rockfall into the gorge. Then looking at our helicopter-borne photography, we found it. It was indeed a fresh rockfall straight into the gorge, right at a place from which it appeared a backed-up reservoir had issued a flood. Furthermore, Greg showed that the gorge had experienced many smaller rockfalls or other erosional events over the previous decade, but this bigger one seemed to be fresh. The gorge now seemed the likeliest culprit, but at first it seemed difficult to comprehend how much water could be stored in the gorge behind a rockslide dam. In the days after the disaster, I examined amateur video of the event taken from Pokhara, a couple dozen kilometers downstream from the gorge. I watched as the flood reached Pokhara and as floating trees trunks poured over a dam. It provided the first best opportunity to measure the speed of the floodwaters and its depth and width, and thus measure the volume rate of flow and estimate the total flood volume. The flood came in waves, and the first wave alone was around a quarter of a million cubic meters in just a few minutes. There were about 27 waves in all over the next hours, according to eyewitnesses, so several million cubic meters overall. At first it seemed a stretch for any one of the suggested water sources to explain the water volume, and this still is a part of the challenge to provide the full explanation of this event. Even my grandson, also intrigued as well as horrified by the disaster, brought his 7-year-old intellect to bear and suggested that it was friction that melted snow and ice that had tumbled off the peaks. Indeed, the conversion of gravitational potential energy to heat could have melted roughly a tenth of the falling snow and ice by the time it reached the Seti River. Nothing seemed quite sufficient; every potential source at first appeared an order of magnitude insufficient to explain the water volume. It seemed that all of the possible sources together might explain the floodwater volume. Yet one source seemed to be definitely involved, and that was a rockslide-dammed reservoir in the gorge. 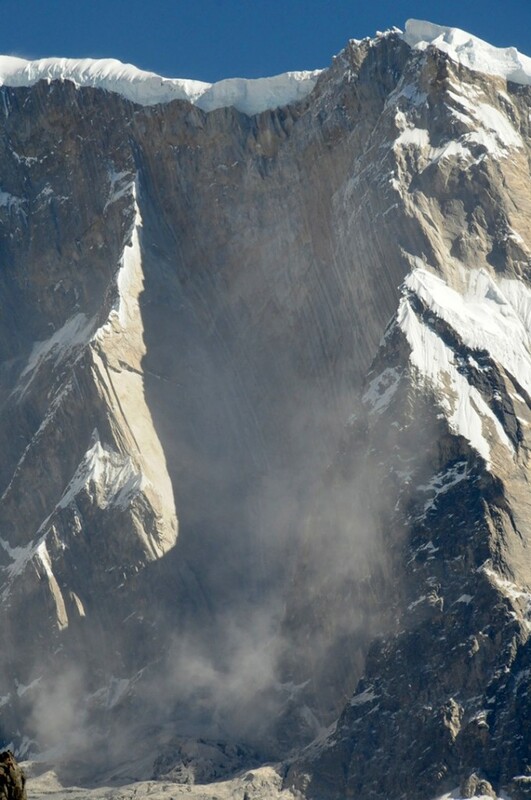 A view of the gorges and also the distant peaks of the Sabche Cirque and the ancient glacial deposits in between. 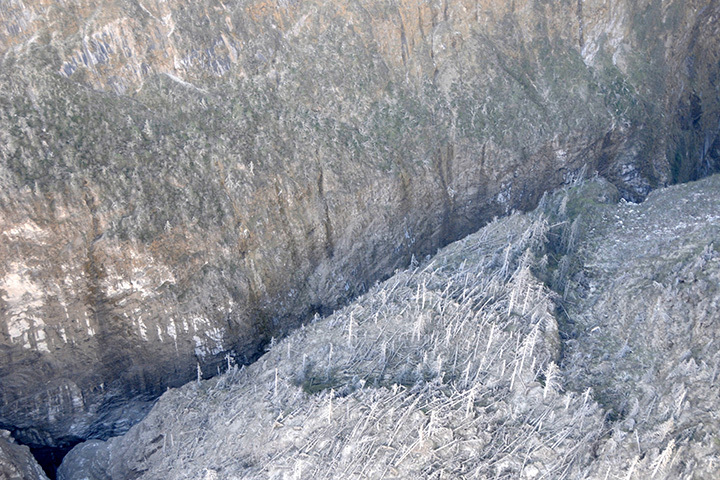 The avalanche entered the gorge from the upper right corner of the scene. I returned with colleagues to the Sabche Cirque three more times, and we were able to land and set up camp and undertake detailed geological observations. 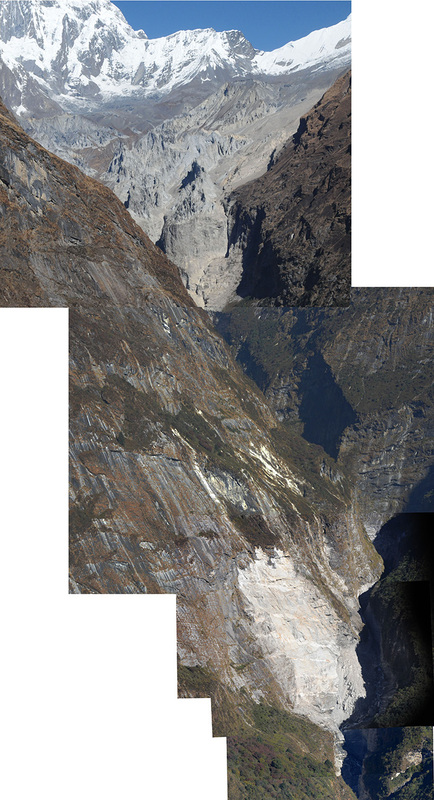 The Sabche Cirque is a violent but beautiful place, with rockfalls, snow and ice avalanches, and flood dangers abounding, and evidence of big and recent geologic activity everywhere we walked or flew. We sampled and later chemically and mineralogically analyzed the dust fallout from Captain Maximov’s brown cloud, and linked it to the sediment deposited by the flood on the ravaged villages downstream. We analyzed the bedrock, the boulders of the avalanche, and searched for other evidence of floods and debris flows. That evidence is everywhere. However, the more we searched, the more it became evident that this was definitely not a GLOF, but was caused by a rockslide into the Seti River gorge, formation of an impoundment reservoir over a several week period due to damming of spring snow and ice melt, and then the final triggering event of the mighty rock and ice avalanche off Annapurna IV. On our most recent trip we used a laser device to determine the depth and width of the gorge and discovered that it is so immense that it alone might account for the required water volume. Although this was a terrifying and deadly event, by geologic standards it was not particularly huge. The death toll was due foremost to people living in harm’s way on the lowest terrace and even on the lowest floodplain. Our findings do not bode well for the future of the small settlements scattered along the riverside, and there would seem to be a strong case for resettlement. ACKNOWLEDGMENTS. 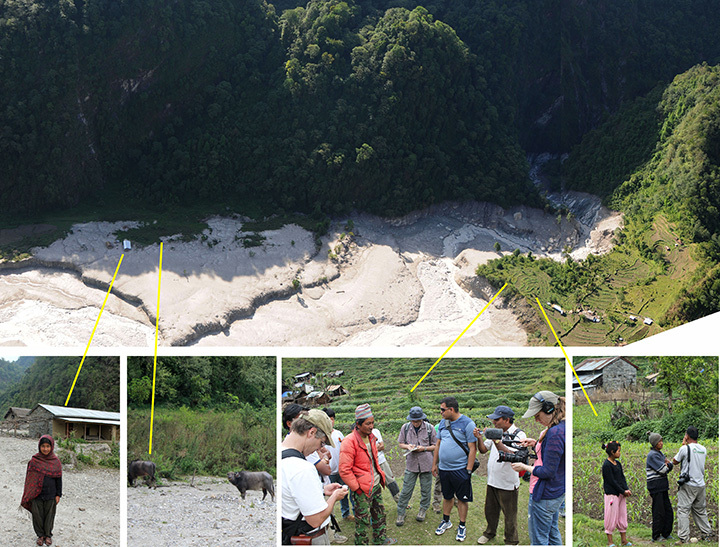 This sequence of events was pieced together from many data sources, and many people were involved, among them my colleagues and myself, but also Captain Maximov, local villagers, landslide blogger David Petley and his associates; research staff and my field assistants from ICIMOD, especially Sharad Joshi; my other Nepalese colleagues, including Dr. Dhananjay Regmi and Dr. Lalu Poudel; our chief climber, JB Rai and his Sherpa assistants; and two doctoral students, Khagendra Poudel and Bhabana Thapa, who are investigating the geomorphology and sociology of the disaster. I also need to give special thanks to my tireless assistant, Greg Leonard, who was the prime satellite image analyst as well as my chief field assistant. Finally, I express gratitude to the NASA/USAID SERVIR Applied Sciences Team, NASA’s Cryosphere Program, and the USAID Climber Science Program, who funded different aspects and phases of this work, and the U.S.-Japan ASTER project, which provided the ASTER imagery. This work will be presented in more complete detail within an upcoming peer-reviewed scientific publication. This entry was posted on Friday, January 24th, 2014 at 10:34 am and is filed under Uncategorized. You can follow any responses to this entry through the RSS 2.0 feed. Both comments and pings are currently closed. the story and the threat to local people is far too serious for jokes like this. 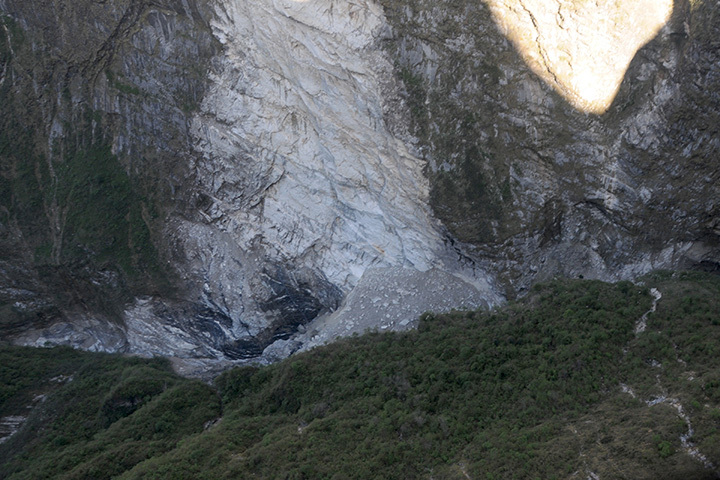 The origin of water in debris flow is many times an enigma (eg Husascarán disaster in Peru 1970). you added a headline that grabbed a person’s attention? Leoma, I agree. Anyway, it was not a title I suggested, and it was posted before I could blink my eyes. But I am happy that Earth Observatory is increasingly adding experts’ data, models, experiences and perspectives.